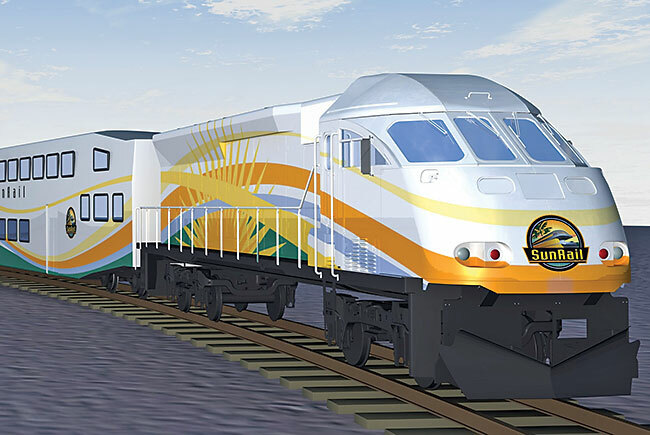 Work is proceeding on tracks and stations for central Florida’s publicly funded $615-million SunRail commuter train, which is expected to begin service May 1. SunRail is scheduled to run along a 32-mile line between DeBary in Volusia County north of Sanford and Sand Lake Road south of downtown Orlando. A second phase to build out the 61.5-mile route, extending to DeLand to the north and south to Poinciana in Osceola County, is scheduled to open in 2016. Bombardier is providing 20 passenger cars (a $41.7-million contract) and will operate and maintain the trains (a $195-million contract). The state projects 14,500 daily boardings by 2030. Base ticket rates will be $2, plus $1 for each county line crossed with discounts for frequent riders, the elderly, disabled and kids. Investors and developers already are eyeing projects that could capitalize on proximity to stations. “We’re seeing a lot of development around the station sites, or interest,” says transportation department spokesman Steve Olson. In July, Fort Lauderdale city commissioners agreed to tax downtown property owners to provide the last financing needed for construction of The Wave, a 2.7-mile, $142.6-million downtown streetcar rail line. The first 1.4-mile downtown loop is scheduled to open in 2016. Federal taxpayers will cover half the cost of the project, with a quarter coming from the state and a quarter from local sources, including those downtown owners. Passenger fares haven’t been established by the county, which will own and operate The Wave. Many riders are projected to come from Broward County’s public bus terminal downtown, the courthouses and hospitals. Tourists, residents and office workers also are projected to use it, especially since they can connect to it from individual buildings and neighborhoods through Sun Trolley, a trolley-like bus that reaches the beach, neighborhoods, Tri-Rail, Las Olas Boulevard and the airport. Sun Trolley has increased ridership in the last two years and carries 40,000 to 48,000 passengers per month.